In the 1870’s the United States had just passed through a silver panic that had caused the price of silver to plummet. Old coins that had been hoarded because of their silver value were now worth more as “ordinary money” at face value, so a flood of old and worn coins were now making their way into circulation. In Congress a new law was about to be passed that was intended to benefit the struggling silver mines of Nevada and other western states, and the U.S. Government was about to be required to purchase between two and four MILLION dollars worth of silver every month and convert it into silver coins. 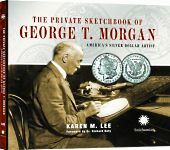 Henry Linderman, the Director of the U.S. Mint, saw that the country had an urgent need for a new silver dollar coin, so he staged a competition between William and Charles Barber, the father and son team who had worked at the Philadelphia Mint for years, and George T. Morgan, the young new engraver that Linderman had brought over from England. 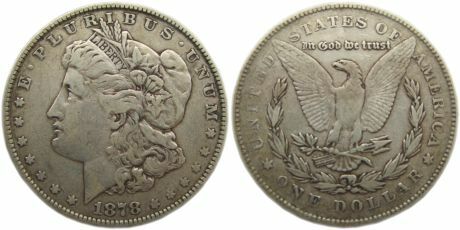 Both the Barbers and Morgan came up with a design featuring a Liberty head, but Linderman preferred Morgan’s design, and the Liberty Head dollar (more commonly known as the Morgan dollar or the Morgan Silver Dollar) was born. The first production runs of the new coin were characterized by problems. There is a story that an expert on birds complained to the Mint that the eagle depicted on the reverse side of the coin had the wrong number of tail feathers. According to the expert, eagles always have an odd number of tail feathers, but Morgan’s eagle had eight. Another problem was that the original hubs (a relief or raised image of the coin) to produce the coin were made a little too shallow, so that the resulting coins were not as sharp in detail as they should have been. To correct both problems, new hubs were created in which the eagle has seven obvious tail feathers. The dies used to create the coins were ground down before the new hubs were used to create the design, but unfortunately the dies were not ground down completely and some of the new coins showed faint impressions of some of the tail feathers in the original design “underneath” the feathers of the new design. Coin collectors call these coins “7/8TF” dollars. This second set of hubs still had too low a relief, so a third set was created late in 1878. Coins minted from these hubs have a few variations from the earlier design, such as a different angle in the fletching (feathering at the top) of the arrows clutched in the eagle’s talon, or in the additional detail on the eagle’s breast. Morgan Silver Dollars are very popular with collectors today, but they were not very successful with the general population at the time. People in the Northeast tended to prefer paper money anyway. In the West and the South people liked to use coins because it seemed more like “real money,” but the Morgan dollar was criticized because it was so large and so heavy. (It was given the nickname “the Cartwheel” because of its size and weight.) Even the design of the Morgan dollar was subject to criticism. Some people said that Lady Liberty actually looked a little overweight, and many people complained that the eagle on the reverse side looked more like a buzzard than an eagle (hence the nickname “Buzzard dollar”). One strange characteristic of the Morgan dollar production run is that many of the earlier Morgan dollars were actually melted down and reminted into the later Morgan dollars in 1921 (which is why many of the earlier dates are now so scarce). Interestingly, the large size and weight of the Morgan dollar made them very popular as props in Western movies and television shows. They also were used from the 1950’s into the 1970’s at the casinos of Las Vegas. Most of the Morgan dollars in collectors’ hands today are from the various hoards of the coins by banks and other financial institutions who could not keep the coins in circulation because they were so unpopular with customers. Since the hoards were stored in bank vaults in bags, the characteristic markings on these coins from the coins knocking together are known as “bag marks.” Another significant source of the coins was LaVere Redfield, a Reno, Nevada resident who had hoarded more than seven million dollars worth of Morgan dollars. His hoard was sold at auction in 1976. Morgan dollars were originally issued every year starting in 1897 through 1904, with one reissue in 1921. The following year the Peace Dollar replaced the Morgan dollar as the Mint’s standard silver dollar design, and the production of the Morgan dollar passed into history. Filed under Coin History, Morgan Silver Dollar.